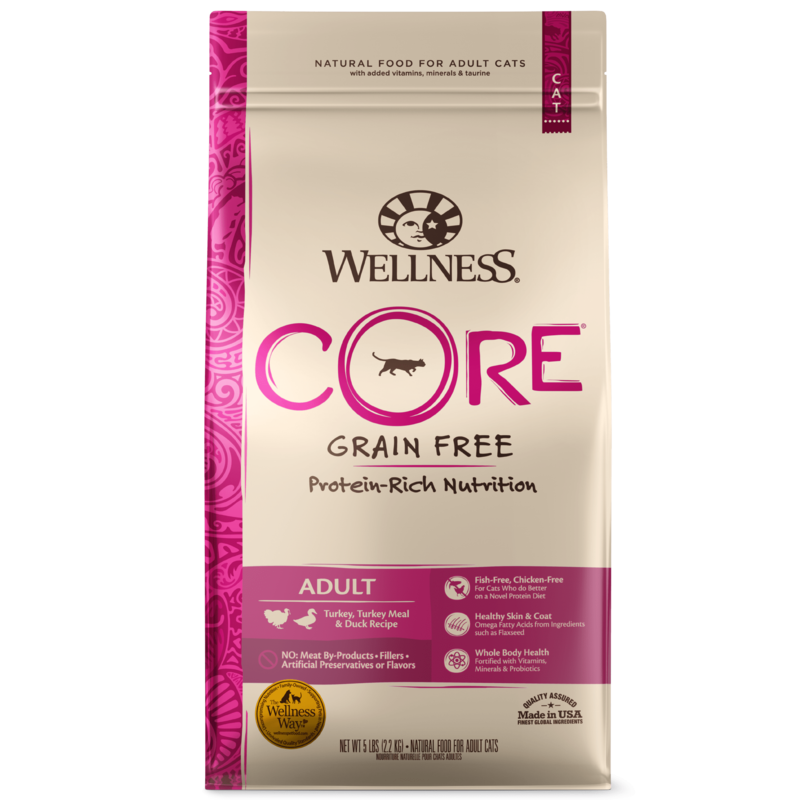 INGREDIENTS: Chicken Broth, Turkey, Chicken, Tapioca Starch, Dried Egg Product, Natural Flavor, Tricalcium Phosphate, Sunflower Oil, Potassium Chloride, Salt, Vitamins (Vitamin E Supplement, Thiamine Hydrochloride, Niacin, Vitamin A Supplement, Pyridoxine Hydrochloride, d-Calcium Pantothenate, Riboflavin Supplement, Folic Acid, Vitamin D3 Supplement, Biotin, Vitamin B12 Supplement), Minerals (Ferrous Glycine Complex, Zinc Glycine Complex, Manganese Glycine Complex, Copper Glycine Complex, Sodium Selenite, Potassium Iodide), Taurine, Choline Chloride, Guar Gum, Magnesium Oxide, Thiamine Mononitrate. 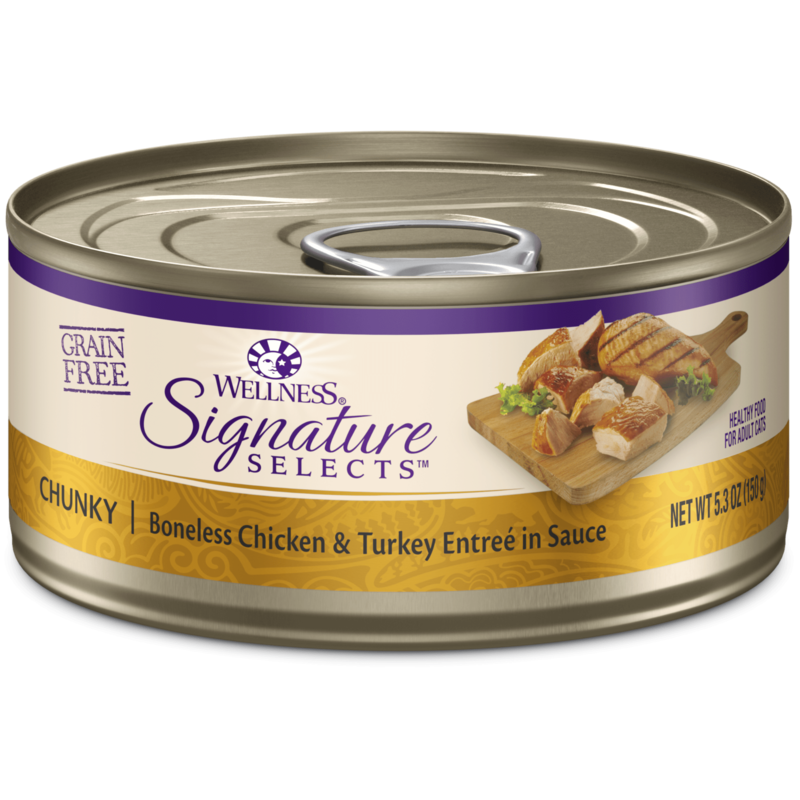 Wellness® Signature Selects™ Chunky Turkey & White Meat Chicken Entrée in Sauce is formulated to meet the nutritional levels established by the AAFCO Cat Food Nutrient Profiles for maintenance. Chunky Turkey & White Meat Chicken Entrée in Sauce – 2.8 oz. Feeding Information: For adult cats. Best at room temperature. Refrigerate unused portion. Always provide access to clean, fresh water. Adjust as needed. To feed alone: about 3 to 3 ½ cans per 6 – 8 lbs of body weight per day. To feed with dry: reduce dry by 1/8 cup for every 1 can wet. Calorie Content: (ME Calculated, as fed): 892 kcal/lb or 70 kcal/can. Chunky Turkey & White Meat Chicken Entrée in Sauce – 5.3 oz. Feeding Information: For adult cats. Best at room temperature. Refrigerate unused portion. Always provide access to clean, fresh water. Adjust as needed. To feed alone: about 1½ to 2 cans per 6 – 8 lbs of body weight per day. To feed with dry: reduce dry by 1/8 cup for every ½ can wet. Calorie Content: (ME Calculated, as fed): 892 kcal/lb or 134 kcal/can.